In November last year , I was in Shanghai for a meeting. 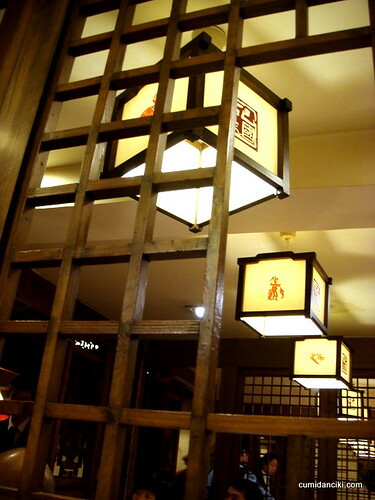 A place that really stood out for me was this reastaurant that served Traditional Shanghainese food. The first thing you will notice when you step inside the restaurant is the raised stage, that is the center attraction of the room. Apparently this is one of the best Sichuan/Szechuan dinners in town, complete with the famous cultural performance of “face-changing” masks or Bian Lian. The performance is an ancient art form that is secretly held by its masters. There is a brilliant movie in 1996 by the chinese director Wu Tian-Ming called “King of Masks” or “Bian Lian” which tells the tale of such a master, the dying art and other cultural/social insights of old China. A must see by all ages! 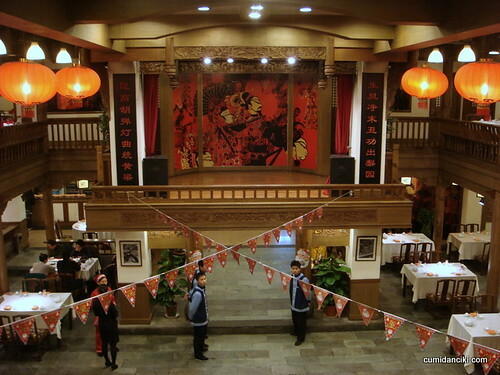 All the tables are arranged to face the stage and we had ‘private’, open concept rooms each, facing the stage. The food looks fantastic but I am a little hesitant about digging right in because the theme for the night is Sichuan i.e. ‘chili corns’ or ‘chili oil’ in epic portions, and I of all people know the less than appealing side-effect of too much chili oil. This noodle you see, tastes and has the texture of chee cheong fun (rice flour noodles) but the only difference is the spicy chili sauce that it comes with. 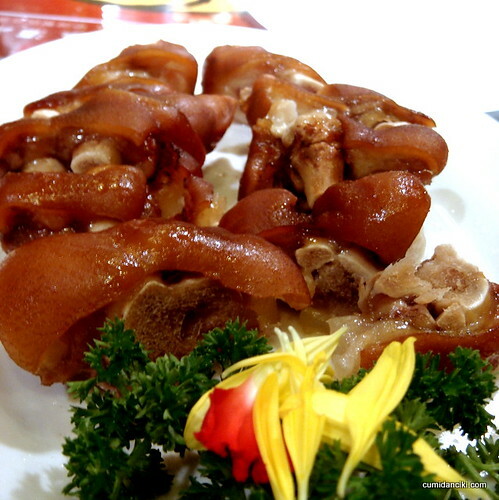 Pork knuckle, chopped up into bite sizes to aid munching. 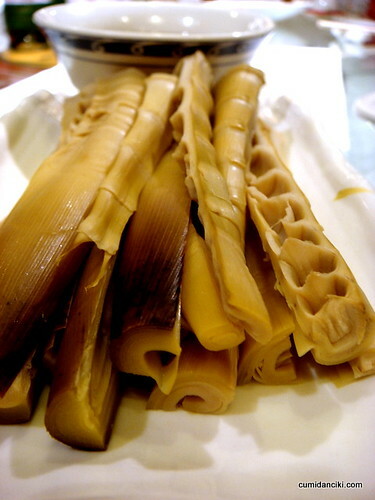 Bamboo shoots to nibble on and this comes with more spicy chili oil dip. 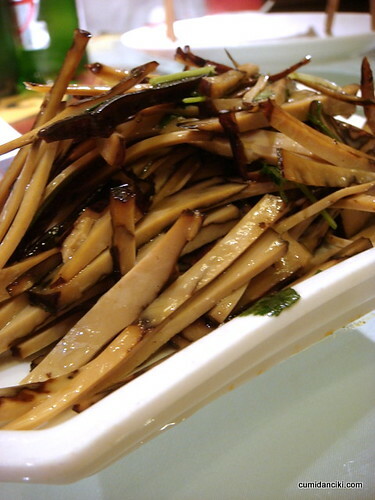 More chewy bamboo – excellent beer food. Strips of pork belly, to be dipped in chili oil and garnished with cabbage. The amount of chili oil they use in this meal is astronomical. The face changing, or “bian lian” in Chinese, is an amazing feat. Too bad the stage was so far away from were we stood, so even the best zoom only can do so much. Anyway, the performer is suppose to wave his arms and twist his head, and this will result in the painted masks changing repeatedly. Face changing began 300 years ago, during the reign of the Qing Dynasty. Initially, the basic art was that, opera masters would changed the color of their faces during performances by blowing into a bowl of red, black or gold powder. The powder would adhere to their oiled skin quickly. Sometimes, the actors would smear their faces with colored paste concealed in the palms of their hands. The changing of types of lian pu (Chinese opera facial make-up) and colours reflect a character’s mood: for instance, red represents anger and black represents extreme fury. Face-changing was first used in a story about a hero who stole from the rich to help the poor. When he was caught by feudal officials, he changed his face to puzzle them and escaped as a result. How clever! More recently the opera masters began using layers of masks made of oiled paper or dried pig bladder. Skilled performers could peel off one mask after another in less than a second. Modern-day masters use full-face painted silk masks, which can be worn in layers of as many as twenty-four, and be pulled off one by one. This is what I call being “thick skinned’. Anyway, after that really interesting performance, back to the food. This next dish , I did not have the guts to touch – beef and chicken sashimi. 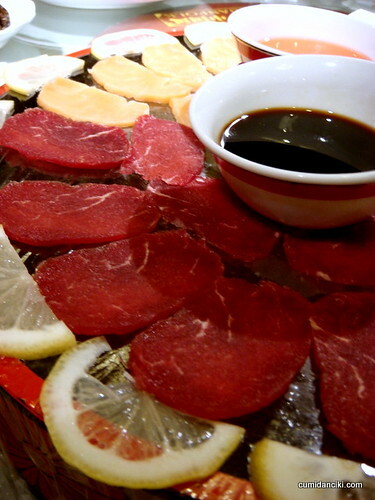 Well, let me just say that if there is one thing I will not eat in China, it is raw meat. That’s just tempting fate, really. 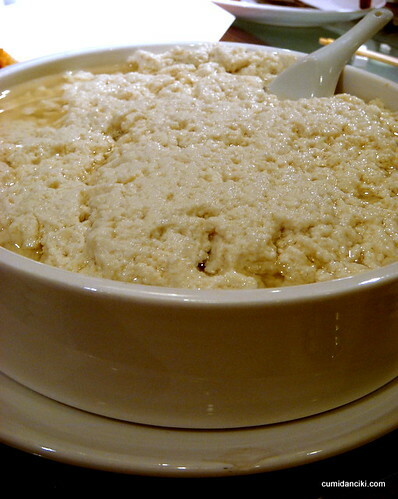 Some from of tofu. The texture was rubbery but I guess the best way to eat this is with more chili oil? 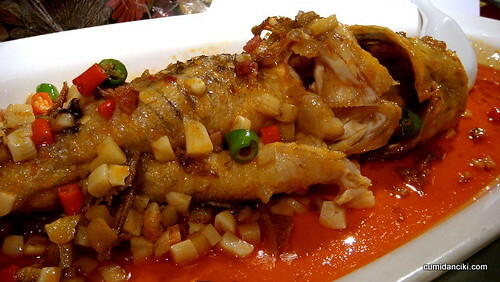 Deep fried fish in Chili oil. This was just so-so. The fish was not that fresh. Satay prawn – another addictive beer snack. These were stone grilled and had a gorgeous smoky aroma. At some point someone ordered the famous Maotai, that is arguably the most famous Chinese liquor, or baijiu. 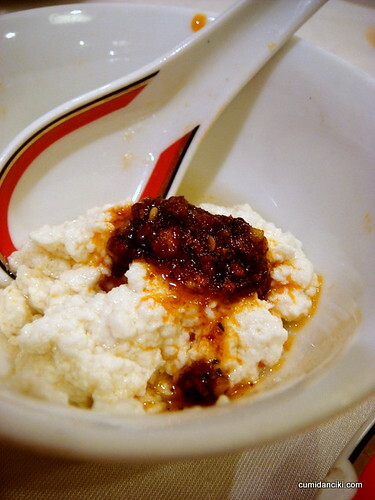 It is produced in a town called Maotai, in the city of Renhuai. I was told by my Chinese colleagues that this town of Maotai possesses a unique climate and vegetation that contributes to the taste of the drink. Maotai, which is classified as sauce-fragranced because it offers an exceptionally pure, mild, and mellow soy sauce-like fragrance that lingers after it is consumed, is distilled from fermented sorghum and comes in different versions ranging in alcohol content from the standard 53% by volume down to 35%. We had the 53% one! That devilish smile of the pretty waitress tells you that she knows how the night is about to degenerate. What can I say? The Maotai tastes like what turpentine smells like. Interestingly though, if you consume the Maotai with loads of chili peppers the taste is actually bearable. Here is the chicken chili peppers. There is no way to avoid the burn even if you do pick out the chili bits because even the chicken has absorbed the sting of the chili due to the cooking style of this dish. Finally the waiter brings in the sweets. 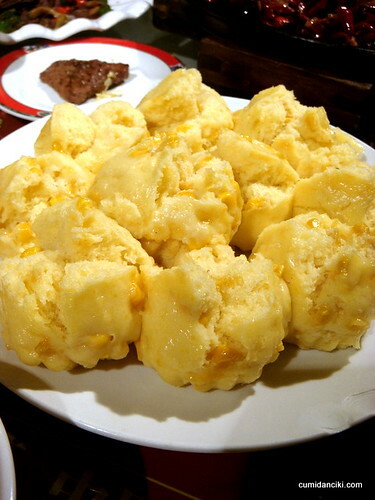 This is the corn dumpling – extremely sweet and doughy. 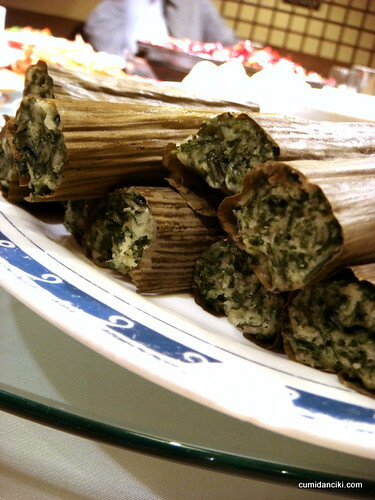 And some sort of vegetable dessert made with chives and flour but prepared as a sweet. 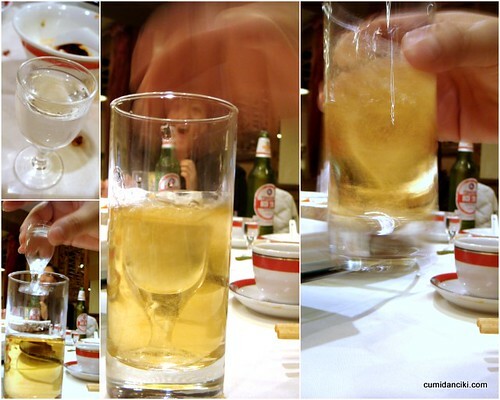 The Maotai – pungent and dangerous. But not as dangerous as when drunk as this abomination. Submarine. The chinese version of the submarine is Tsingtao Beer with Maotai submerged in it, drunk as one swift shot. My Chinese colleagues told me this “If you want to close a deal with the purchasers , you must drink. One bottle Maotai, one million dollar deal”.. So drink! Three shots later and you will feel the earth move under your feet, not to mention the lurching contents of your stomach. My Chinese colleagues can drink 10 – 12 shots of these and still stagger home. Amazing! The tea pouring performance was the last presentation for the night. By this time, most of us were clutching our maotai-ed heads, unable to really appreciate the full extent of this amazing tea acrobatics/kungfu. Tomorrow is a new day, thank God.. and tomorrow.. I get to visit the famous Whampoa Club! Previous articleGoodbye 2009, welcome 2010! 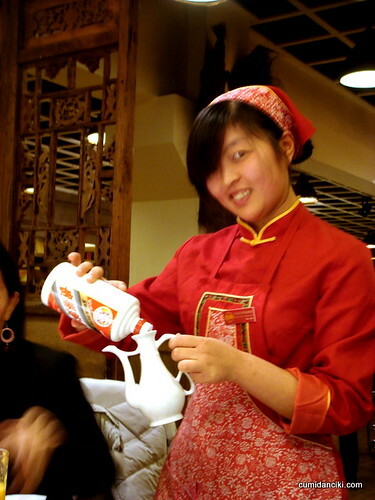 I’m surprised they didn’t serve you Maotai with Chili Oil! 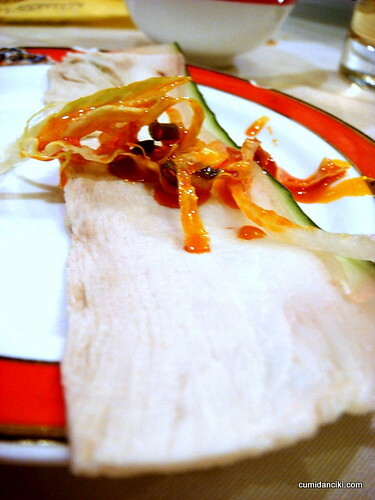 The strips of pork belly – awesome presentation! My goodness! 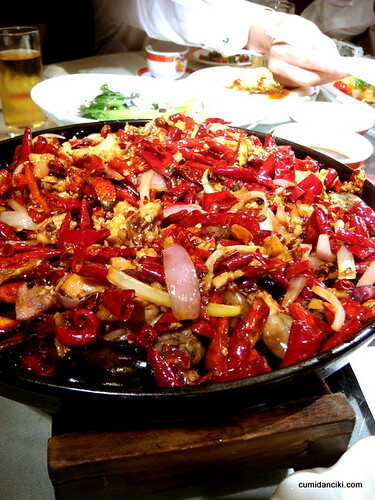 That’s really a LOT of chili oil…..
That’s a lot of food! 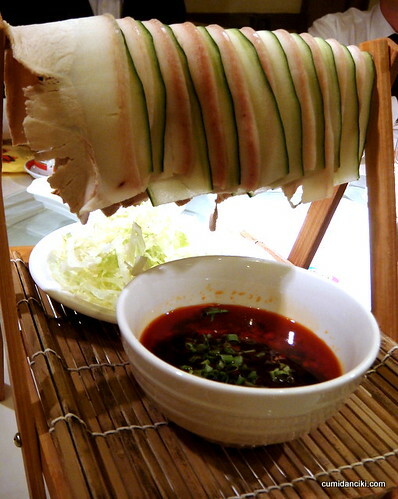 I like the way they serve the hanging pork strips! Very creative! I think the only food I can stomach for the entire dinner is the strips of pork belly, minus the chilli! HEhe.. I certainly got to travel more! Happy belated new year to you! All the foods were gorgeous and look tasty from your sharp photos. 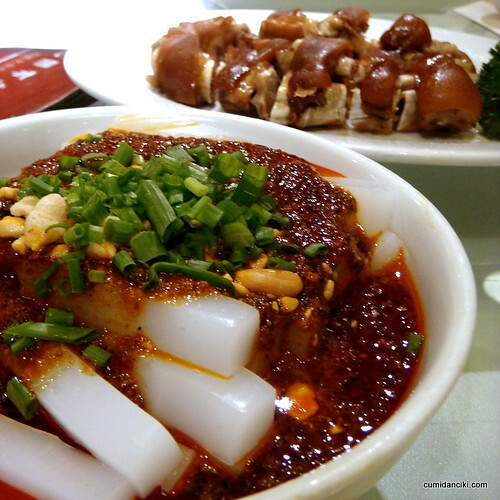 I love Sichuan food and it is not just about chilli oil – shame you did not get the full experience. Sounds like a work dinner so they were probably throwing lots of fancy but not necessarily great food and maotai at you to impress you… maotai is an abomination you are right, i think they drink it just to get drunk ASAP and not for flavour! 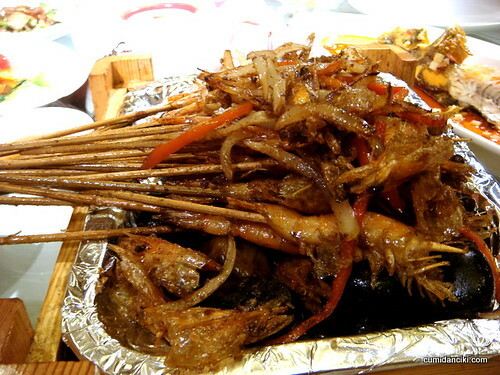 i think my stomach would have burnt out with all those …yes chili oil!